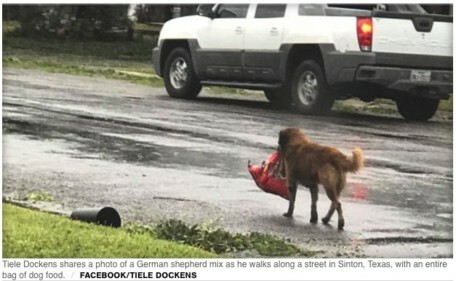 When Salvador Segovia’s German shepherd mix, Otis, got loose and disappeared from his backyard Friday night, the Sinton, Texas, resident didn’t completely panic. After all, this isn’t the first time the dog has ventured out on his own. Otis is well-known in the small town of 5,000.
ut Segovia has never witnessed his dog do something quite like he did this weekend — and he wouldn’t have believed it if there wasn’t proof. On Saturday morning, Otis was spotted on his way home hauling an entire bag of dog food with his teeth. Dockens was driving around town to examine the storm damage with her husband around 10 a.m. when she saw the dog. Her husband stopped the car so she could snap a picture. Dockens posted the picture on Facebook, and within five minutes she received confirmation — the dog was in fact Otis. Dockens couldn’t help but laugh at the situation, which she calls a welcome relief as Harvey continues to pound the region.